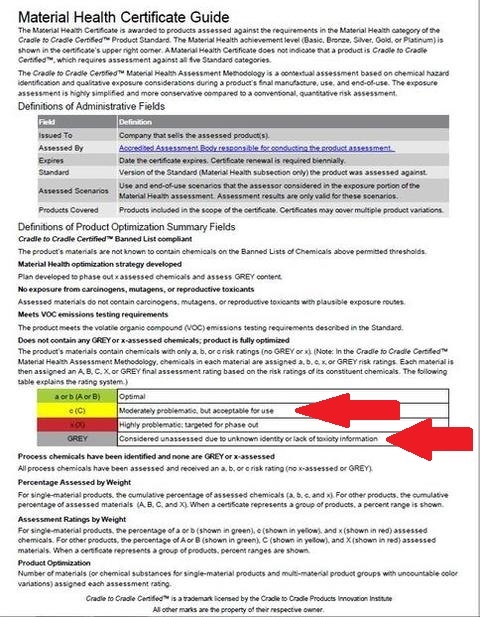 How many chemicals are in the latex in my Berkeley Ergonomics Mattress? in the latex in my Berkeley Ergonomics mattress. 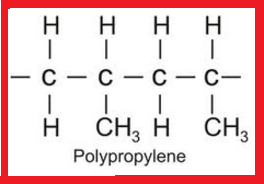 22 Chemicals deemed "moderately problematic but acceptable for use". For me it's a failure in comfort, durability, & design. 1. It's HOT even though the salesman told me it would not be. I think the very thick quilting and large amount of wool are the cause. 2. When I sit on the edge, I sink. Maybe because there is little to no support on the sides or because there are no layers of material under tension providing strength and durability, (like in most mattresses)? 3. It does not seem durable at all. For example, I could never let a child jump up and down on it like when we were kids. 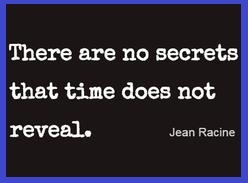 It is far too fragile. Maybe because it is just 2" of latex laying loosely on the coils. I feel like I have to 'baby it' this bed. 4. Because there is no 'tension' in the mattress layers like most beds, this bed seems very "loosy-goosy". ​It seems mushy, worn out, and 'sad' after having it only a short time. 5. I don't think 2" of latex is enough to just lay loosely over springs. It reminds me of something you would get at Ikea. Very simple and minimal with no frills. I think the lack of "tension" [that would normally be present in a mattress] bothers me about this bed. It just feels mushy. 6. The very thick quilted cover totally diminishes the feel of the latex. I can't feel the bouncy, rubbery, supportive sensation that latex provides. My next bed I want a thin very stretchy cover with no quilting. 7. The thick wool filled quilting matted down very quickly. Other beds usually have a little foam in their quilting so it remains voluminous and puffy for years, but my Berkeley Ergonomics quilting does not contain any foam so it does not spring back like other mattresses I have had and liked. 8. For some reason the sides sag. I have wondered if they accidentally made the exterior too large because its seems to large for the contents. It seems so loosy-goosy. Maybe if I were to add another slab of latex, it might give the mattress the strength and stability it appears to be lacking. 9.The Talalay Latex broke down real fast. I found cracks in it within a few months of having it. If I try and handle it, it cracks easily. If I am not very careful & mindful of supporting it every few inches I think it will crack in two pieces. If I grab it too firmly, my fingers will go right through it. I am now told this is typical with Talalay Latex. Next time I want Dunlap. 10. 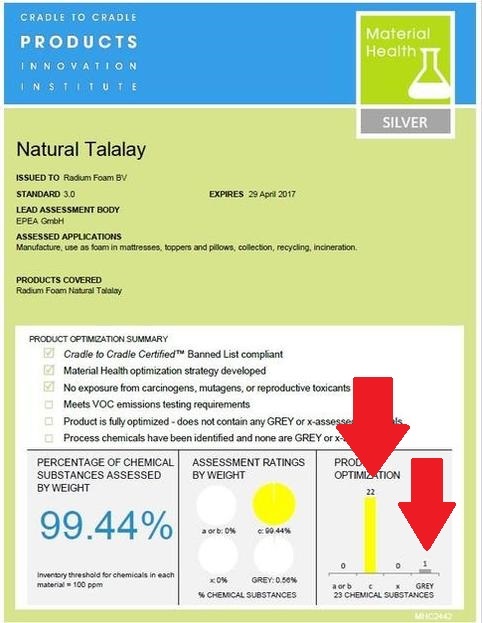 The mattresses exterior cover isn't even an "organic cover" even though the salesman said the mattress was "all organic". 11. There are 23 chemicals in the latex. 22 deemed "moderately problematic, but acceptable for use" and one chemical deemed 'unknown'. ​See the two page Material Health Certificate below or by clicking here. 12. 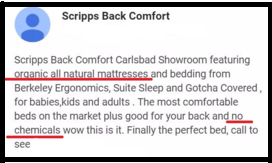 The salesman advised that due to the zipper, "its the last mattress you will have to buy" and years later still makes this claim on his web site even though Berkeley Ergonomics recommends replacement in 10 years. Important; I am not nor have I ever been in the mattress industry. I do not have an allegiance to any mattress firm, nor am I paid for my views. 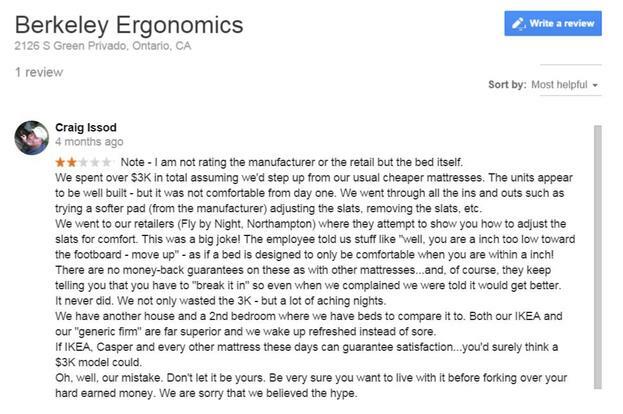 My opinions and views are based on my own consumer experience with my Berkeley Ergonomics mattress, the Berkeley Ergonomics dealers, and Berkeley Ergonomics themselves in Ontario Calif.
Berkeley Ergonomics repeatedly claims that I am a competitor or paid by a competitor but this is just another misrepresentation. More reviews to follow....please check back. 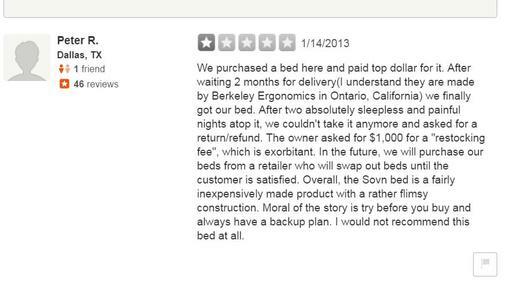 the review images above are not legible, here they are typed out; Berkeley Ergonomics mattress reviews NON-REFUNDABLE $2000+ mistake. 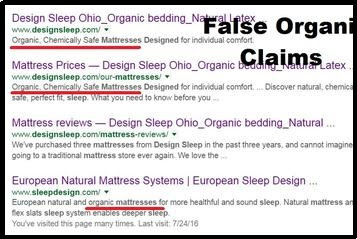 Company unable to provide proof that mattresses meet any of their claims: Oeko-100 certifications or meet any organic certificates. I received the brush off when I called Design Sleep requesting Oeko certifications, USDA organic certificates, or anything really. 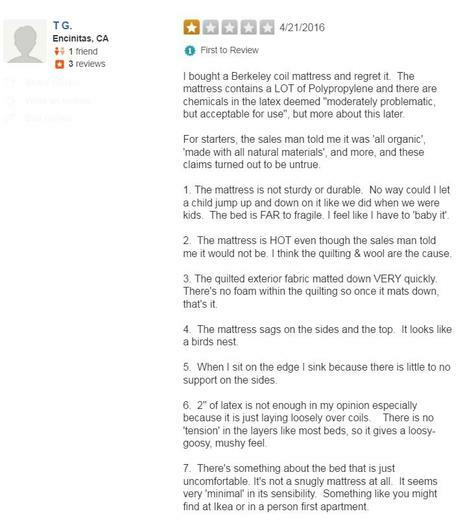 I was nervously directed (before being hung up on) to the manufacturer, Berkeley Ergonomics, which as you can see in the provided link, (debralynndadd.com/q-a/be…) others as well as myself have been unsuccessful in obtaining any verification that these mattresses live up to their claims. It is not possible to locate Berkeley on the Oeko website and Berkeley/Design Sleep will not disclose the manufacturers of their products. Go to Savvy Rest, Naturpedic, etc. 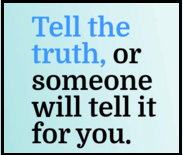 and those companies provide all information about their manufacturers and actual proof of lab and organic certifications (GOTS, USDA, Oeko, etc). Furthermore, the mattress itself has been extremely uncomfortable from day 1. The only solution I was given was to keep trying more and more ridiculous insert options. The bed sags, it's mushy, feels as though the sides will collapse and dump you on the floor if you get anywhere close. All-in-all it feels cheaply made and who knows where the material came from or what it's potentially off gassing. 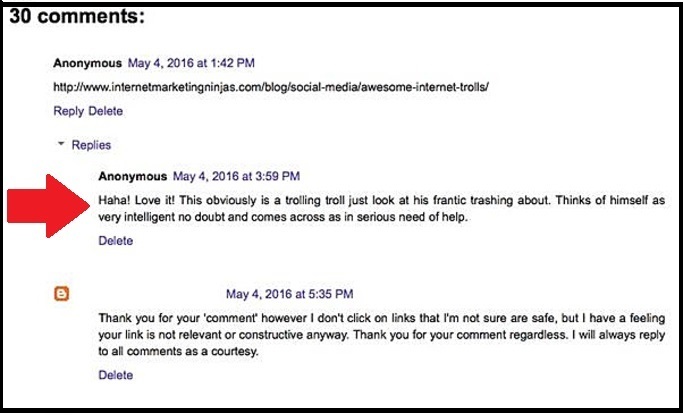 2.Believe the bad customer service reviews. Same problem. If you're lucky enough to get a call back they are short, disinterested and rude. Our Silhouette mattress made by Berkeley Ergonomics was sold to us as a top of the line "European" all natural organic mattress. The pitch was great and we liked the bed in the store but what arrive has never felt remotely like the one in the showroom. 2 years of sore backs later we just bought a new mattress and the $4000 mistake is now sitting in the garage. Urge you greatly to find a different store.3.We purchased a Berkeley Ergonomic bed here and paid top dollar for it. After waiting 2 months for delivery(I understand they are made by Berkeley Ergonomics in Ontario, California) we finally got our bed. After two absolutely sleepless and painful nights atop it, we couldn't take it anymore and asked for a return/refund. The owner asked for $1,000 for a "restocking fee", which is exorbitant. 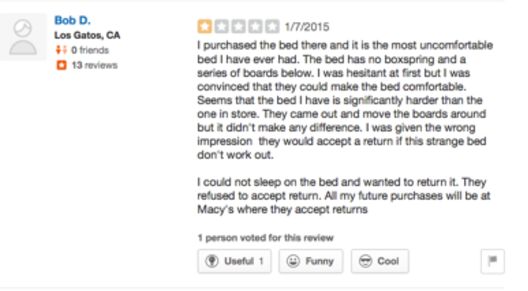 In the future, we will purchase our beds from a retailer who will swap out beds until the customer is satisfied. Overall, the Sovn bed is a fairly inexpensively made product with a rather flimsy construction. Moral of the story is try before you buy and always have a backup plan. I would not recommend this Berkeley Ergonomic bed at all. 4.I purchased the bed and it is the most uncomfortable bed I have ever had. The bed has no box spring and a series of boards below. I was hesitant at first but I was convinced that they could make the bed comfortable. Seems that the bed I have is significantly harder than the one in the store. They came out and moved the boards around but ti didn't make any difference. I was given the wrong impression they would accept a return if this strange bed didn't work out. I could not sleep on the bed and wanted to return it. They refused to accept return. All my future purchases will be at Macys where they accept returns. 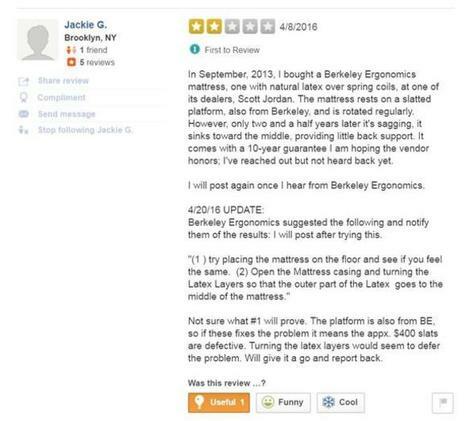 5.Berkeley Ergonomic Mattress reviews are hard to find but glad to see them here. Seeing that a 5 star rating was given by two people who haven't even purchased I felt the need to chime in. We purchased. Very sorry we did. Very expensive and now we're stuck. We tried everything to rectify the situation but I'm at a point now where I look forward to sleeping on a hotel mattress when I travel!!! The bed doesn't work for either my husband or me. I'm sure there are people out there who love their bed...kind of hard not to when your into a bed for 3k, but we would get rid of ours today if we had the money to buy something new. 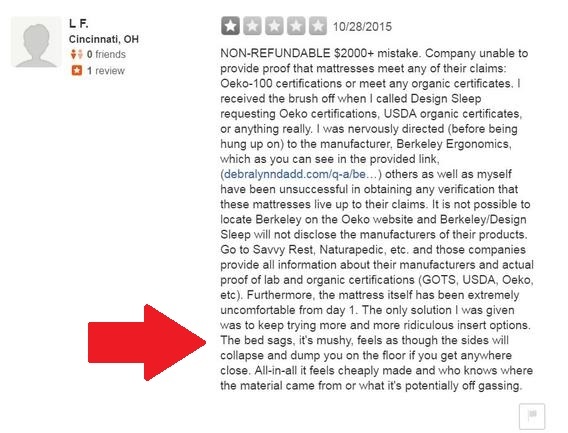 Wish we had first found these Berkeley Ergonomic mattress reviews first. 6.We purchased a Berkeley Ergonomic bed here and paid top dollar for it. After waiting 2 months for delivery(I understand they are made by Berkeley Ergonomics in Ontario, California) we finally got our bed. After two absolutely sleepless and painful nights atop it, we couldn't take it anymore and asked for a return/refund. The owner asked for $1,000 for a "restocking fee", which is exorbitant. In the future, we will purchase our beds from a retailer who will swap out beds until the customer is satisfied. Overall, the Sovn bed is a fairly inexpensively made product with a rather flimsy construction. Moral of the story is try before you buy and always have a backup plan. I would not recommend this Berkeley Ergonomic bed.all.